The Black Continent has long suffered identically from what the oil-rich countries such as Iran have undergone historically. The pervasiveness of energy resources, minerals, profuse water, oil and gas supplies, gemstones and other precious resources have been the ancient reason for Africa’s subjugation and affliction. 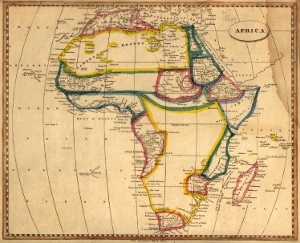 The perennial rivalry of Colonial Powers to gain the ownership of more African lands and properties, their insatiable aptitude to take over tiny African realms and archipelagos and eventually the political failure of unmerited leaders all around the continent could be named the major factors which have been pushing 53 countries and 61 territories to the brink of poverty, conflict and disappointment over the past decades. Africa is undisputedly an ancient, reputable and prestigious continent which should be taken seriously as a key role-player in international developments. It constitutes 6% of Earth’s total surface, accounts for about 14.8% of the World’s population and has been the passageway between Asia and Europe. However, the distorted image of Africa as a downtrodden yet profitable and lucrative continent is portrayed by the mass media. The success stories of democratization in a number of African countries, the rise of hopes and aspirations among the youth generation of Africa and the promotion of numerous prominent figures from this advantageous soil are the neglected stories which should be reviewed. We owe many of our progressions and improvements to the African figures whom we even sometimes forget the nationalities of; notable figures include Nelson Mandela, Fredrik Willem de Klerk, Kofi Annan, Wangari Mathaai, Naguib Mahfouz, and Mohammad ElBaradei. Alex Matthews is a South African citizen journalist and blogger who has been working on the dossiers of Africa for quite a long time. He is affiliated with his country’s most important newspaper, Mail and Guardian and writes in his blog Afrodissident. In an interview with Foreign Policy Journal, Matthews talks about the current situation of some insurgent spots of the African continent, the prospect of economic development, the most important sports event of the continent in 2010 and the local failures of states in Zimbabwe and Sudan. Let’s start with Zimbabwe. The government of Mugabe is under international pressure for what the western states deem his noncompliance with human rights, freedom of press, democracy etc. Of course the inflation rate of Zimbabwe is irrefutable as it passed 250,000,000% last month. What about the people of Zimbabwe themselves? Do they consider their government as unpopular and despicable as the westerners do? Yes, very much so. The government has been deeply unpopular for a long time now; dissatisfaction gave rise to the opposition Movement for Democratic Change being created in 1999. People were tired of the endemic corruption and failure to deliver that characterized Zanu PF rule. In 2000 Mugabe lost a constitutional reform referendum which would have given him greater power. He retaliated with the invasions of white-owned farms in which special punishment was meted out to thousands of farm laborers. The MDC would have won the elections in 2000 and 2005 had they been free and fair – unfortunately there was widespread ballot-rigging and intimidation that prevented this. I have spoken to Zimbabwe refugees in Cape Town as well as to Zimbabweans on my visit to Zimbabwe in January this year and there has been an overwhelming indication that Mugabe and his party is considered corrupt, wicked and evil. Have you ever conducted any research or written essays on the roots of exceptional inflation in Zimbabwe? What this universal figure of 250,000,000% is the indicator of? Do the people there buy goods and commodities 250,000,000 times more expensive than the real prices thereof? In fact the inflation is even higher! The reason why it is so incomprehensibly large is simply because whenever the government of Zimbabwe required funds, the Central Bank of Zimbabwe was forced to print more money. This was done more and more as the economy collapsed. The economy was reliant on the agriculture sector for foreign currency but this sector has been decimated as a result of the takeover and destruction of productive white-owned farms. This has been done for some time now and has resulted in the currency being absolutely worthless. There are severe shortages of everything from food, clean water, medicine, clothes, farm implements and petroleum. The food and goods available are mostly only offered for sale in US dollars; with dollarization, slowly a parallel economy has emerged in which goods and services are paid for in hard currency; namely US dollars, South African Rand and Botswana Pula. People also buy a lot of stuff in neighboring countries and then bring it back home to Zimbabwe. Because of the shortages which have been caused by a government interference, inflation and general economic collapse, the cost of living in Zimbabwe is extremely high. Now we go to your home country. The most important sport events will be happening in Africa the next year; FIFA 2010 World Cup. There was some dispersed gossip regarding the replacement of WC host as the South African government could not manage to meet the required criteria for the event in the terms of transportation, accommodation, venues etc. What do you think about that? Yes, there were those rumors but they have been quashed by FIFA’s head, Sepp Blatter. It is unlikely that FIFA would have made South Africa the host if they did not believe South Africa was able to prepare itself in time. While there have been challenges in preparing for the world cup, the building of the stadiums are on target and infrastructure development is expanding our public transport capacity. South Africa’s accommodation capacity is quite large; to ensure that there will be enough beds for the spectators, the South African National Parks, the government structure that maintains our national parks, has also been brought on board to provide accommodation in their facilities. South Africa’s hosting of the 1995 Rugby World Cup and 2003 Cricket World Cup will also help in providing experience and capacity building. In addition to this, South Africa’s Local Organizing Committee has also been working closely with the German organizers of the 2006 FIFA World Cup to learn and gain knowledge as to the preparations and running of the World Cup here.